Contents: Introduction: Clement and calamity: the case for re-evaluation, Kenneth Gouwens. 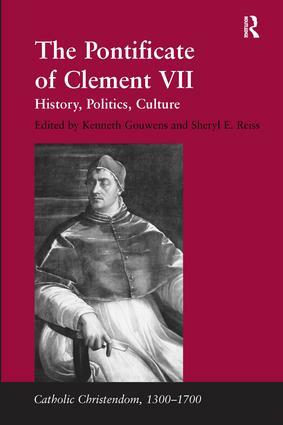 Part 1 History, Politics and Humanism: Character, Politics and Family: Guicciardini, Giovio, and the character of Clement VII, T.C. Price Zimmermann; The 'disastrous' pontificate of Clement VII: disastrous for Giulio de' Medici?, Barbara McClung Hallman; All in the family: the Medici women and Pope Clement VII, Natalie Tomas; The conspiracy of 1522 against Cardinal Giulio de' Medici: Machiavelli and 'gli esempli delli antiqui', Patricia J. Osmond; The Sack of Rome and its Aftermath: Clement VII and Francesco Maria Della Rovere, Duke of Urbino, Cecil H. Clough; Clement VII and the Sack of Rome as represented in the Ephemerides Historicae of Cornelius de Fine, Ivana Ait; Rome during the sack: chronicles and testimonies from an occupied city, Anna Esposito and Manuel Vaquero PiÃ±eiro; The papal court in exile: Clement VII in Orvieto, 1527-28, Anne Reynolds; Resynthesis: The place of Clement VII and Clementine Rome in Renaissance history, Charles L. Stinger. Part 2 Patronage, Cultural Production and Reform: Clement VII as Patron: Clement VII and Michelangelo: an anatomy of patronage, William E. Wallace; Michelangelo and the Clementine architectural style, Caroline Elam; Clement VII and the Golden Age of the papal choir, Richard Sherr; Artists, Musicians and Literati In Clementine Rome: Competition, collaboration, and specialization in the Roman art world, 1520-27, Linda Wolk-Simon; Papal tastes and musical genres: Francesco da Milano 'Il Divino' (1497-1543) and the Clementine aesthetic, Victor Anand Coelho; Seeking patronage under the Medici popes: a tale of two humanists, Julia Haig Gaisser; Antiquity Revived and Renovatio in Religion and Art: Augustan Mediterranean iconography and Renaissance hieroglyphics at the court of Clement VII: Sebastiano del Piombo's Portrait of Andrea Doria, George L. Gorse (appendix 2 by Naomi Sawelson); Adrian VI, Clement VII, and art, Sheryl E.